Aspiring farmers were told “attitude is key” at an event for new entrants to the agricultural industry this week. More than 100 people attended the sixth annual New Entrants to Farming Gathering at BT Murrayfield Stadium in Edinburgh on Tuesday 26th February to learn about the variety of different routes open to them. 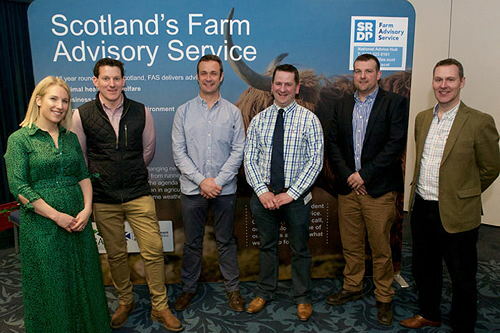 The event was organised under the Scottish Government’s Farm Advisory Service (FAS) programme, and delivered by specialists from SAC Consulting – part of Scotland’s Rural College. Speakers included successful new entrants, businesses who have added value, those who have found alternative routes into the industry, as well as agricultural professionals. Andrew Marchant and his wife Aileen set up Clonhie Farm – a beef, sheep and deer farm business in Dumfries and Galloway – in 2012, and have since diversified by establishing a red deer enterprise in partnership with Buccleuch. Giving the opening address, Chief Executive of the Scottish Association of Young Farmers Clubs (SAYFC) Penny Montgomerie advised people to be brave and ask questions. “Build your networks and get out of your comfort zone,” she said, adding that she had a group of 20 people she could turn to for help. Landowner Richard Rogers entered into a joint venture with one of his workers, Gethin Roberts, after converting his farm in North Wales from beef and sheep production to dairy. He said that by giving Gethin a financial share of the dairy herd, he had the drive to push on and improve things for mutual benefit. Other speakers included Kev Bevan, of SAC Consulting, who talked about business preparations for Brexit and what is likely to happen under various scenarios; Robert Taylor, of the Galbraith Group, who arranges loans for farmers; and Rebecca McEwen, who spoke about the journey undertaken by Arnprior Farm in Kippen from beef, sheep and arable towards growing pumpkins, swimming and glamping.